the 23rd James Bond film is Sam Mendes’ 6th feature. In a career that started with American Beauty, it is hard to surpass oneself, especially with a Bond film. When you are tasked with directing something so near and dear to the fans’ hearts and to the studios' pockets, one wonders what kind of room for artistic creativity there is left, after going through the hoops of satisfying everyone. The plot is nothing new, having been written by the same guys that wrote the last 5 Bond movies. The script hits all the classic Bond points, including the opening theme sequence, gadgets, cars, bond girl and villain. Somewhat reminiscent of an evil Julian Assange, Bardem easily navigates through the role of the evil mastermind with a vengeance - a role he is well versed in as we’ve come to see in No Country for Old Men. Craig again brings his own brand of Bond to the franchise, with his characteristic rough, action-oriented take on spying. Love him or hate him, he is signed to at least 2 more Bond films after this, so we are stuck with this blonde, blue-eyed, Heineken-drinking bond for a little while longer. I personally like Craig, and can safely say that I’m a bigger Craig fan than I am a Bond fan, so I do not mind, but like all Bonds, everyone has a favourite one and you can’t please everybody. Cinematography is very strong and I enjoyed the beautiful images in full IMAX glory, even though at times it slipped into ye olde blue-orange contrast territory, but for the most part I liked it, especially the Scotland scenes filmed at Glen Etive in the highlands of scotland. I can’t say that the plot was amazing, but then again, were Bond movies ever about plot? Mendes makes it much more about the constant fight between Craig and Bardem, reducing the film to the emotional struggle between the 2, with M stuck in the middle (with Judy Dench being as wonderful as always, in her 7th Bond film as M). 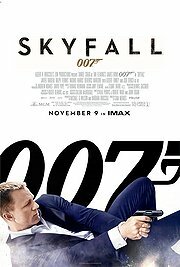 Overall enjoyable, even if formulaic (but then again if you complain about Bond being formulaic, maybe you shouldn’t watch it all together). The computer ‘hacking’ parts could have been made slightly more realistic and less ‘3D representation of computer code’ à la Hackers, and a few other parts defy reality/physics to a good extent, but once you get past that, it’s definitely a fun 2 hours.